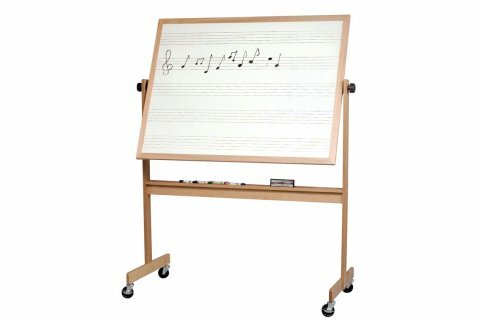 A super sized reversible whiteboard with permanent music lines is just perfect for a music room or band hall. 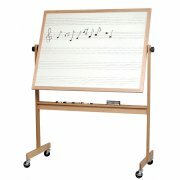 The Deluxe Reversible Dry-Erase Board by Best-Rite is an affordable solution for your music instruction needs. 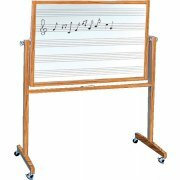 This movable reversible dry-erase board with permanent graphic music lines made from porcelain is set neatly in a useful and elegant wooden frame. The porcelain-on-steel construction makes the board magnetic and very durable. Fill one side of the music board up and then with a simple turn, swing the dry-erase board over and you have a second 4' x 6' board. Lock it into place and you can continue without missing a beat. When you need to return to the original side, just unlock, rotate, and lock again. Full-length accessory tray to store markers and erasers. Stable base design for more safety. Reversible boards provide twice as much room as other boards. The porcelain-on-steel construction makes the board magnetic and very durable. Board has 5 staves, 5 inches apart with a 4-inch border above and below the first and last staff. Lines in each staff are 1" apart.